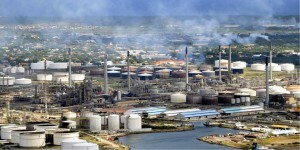 WILLEMSTAD, CARACAS - Venezuelan state-owned PdVSA won't renew its lease with Curacao's government to operate the 325,000 b/d Isla refinery when the current lease expires on 31 December 2019, the energy ministry said late yesterday. But PdV expects that Isla refinery's new operator from 2019 onward will continue to refine, blend, store and ship Venezuelan-sourced crude to the company's export clients mainly in Asia. Venezuela's energy ministry confirmed that negotiations with Curacao's government failed to reach a mutually satisfactory agreement after Curacao's Prime Minister Dr. Bernhard Whiteman announced yesterday that a memorandum of understanding was signed with Guangdong Zhenrong Energy. Under that deal, the Chinese state-controlled commodities trader would invest up to $10 billion in upgrading and modernisingizing the century-old facility. Guangdong Zhenrong would finance 100pc of the capital expenditures needed to modernize the refinery, storage facilities and shipping terminal, build a new gas terminal, and also upgrade the refinery's power and water services infrastructure. "All efforts to reach a new contract with Venezuela did not yield positive results," Whiteman said in a video posted on the Curacao government's website yesterday. "We had to look at other alternatives." PdV and the energy ministry "basically ignored all of the Curacao government's efforts in recent months to negotiate a deal to renew the lease under new conditions including a PdV commitment to spend up to $2bn on environment-related technology upgrades and cleanup at Isla Refinery," said a Venezuelan energy ministry official who disagrees with energy minister Eulogio Del Pino's decision to not seek a new lease. PdV is giving up the Isla Refinery it has operated under lease for almost 30 years for financial reasons. "PdV doesn't have $2bn it can commit to Isla's upgrade," the energy ministry official said.